5 stars isn’t enough for this laugh out loud, beautifully honest, and sometimes heartbreaking novel. This book consumed me in the best way possible right from the start and I’m confident it will be one of my favorite reads ever. 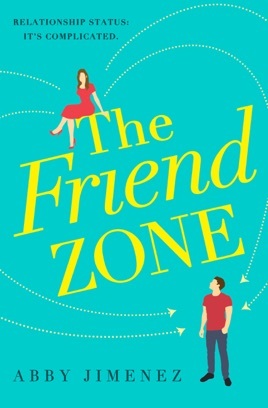 The Friend Zone was one of my most anticipated reads of 2019 and it was more captivating and moving than I ever could have imagined. It’s hard to believe that this is Abby Jimenez’s debut novel! I absolutely loved Josh and Kristen! They were both such perfectly imperfect people. Their struggles (individually and together) were so relatable and honest. They had the best witty banter and their playful barbs were so much fun. I loved how they each gave as good as they got. Things start off on the wrong foot for them, but as they spend more time together, that spark they felt ignites and they recognize that their attraction is more than just physical. They truly see the other and that feeling of being known is so powerful. The build up between these two was delicious and their chemistry was off the charts. I felt all the longing and every stolen moment between them. It was all worth the wait though because when things come to a head, they aren’t just hot, they’re nuclear! Without a doubt, Josh is a shoo-in for my book boyfriend hall of fame. He was everything I love in a hero - loving, considerate, loyal, understanding, funny, protective, intelligent, and an all around good guy. His thoughtfulness and unwavering patience only made him more endearing. Kristen was a fantastically complex heroine. I loved her blunt honesty and take no prisoners sarcasm, even though she mainly used it as armor to protect herself. She was fiercely loyal and cared so deeply and wholly for those that she loved. Her friendship with Sloan was unparalleled and I loved how they complemented each other so well. Yes, Kristen did frustrate me at times with the push and pull with Josh, but given her history and mindset, it made so much sense. One of the things I appreciated most about this book, is that the story was as much a love story between Kristen and Josh, as it was between Kristen and herself. The author’s sense of humor really shines and there are some truly hilarious moments and dialogue that had me cackling like a mad woman. (I’m looking at you Shawn! LOL ) The humor balanced the poignant and heartwrenching scenes so well and readers will definitely want to have some tissues handy for the last quarter or so of the book. Through the tears though, there is also a wonderful message of hope and unwavering love. I don’t think I will ever be able to adequately express how much I loved this book. It resonated and touched me in a way that few books have. It was like the author opened my chest and held my heart in her hands. I felt every emotion while reading this one. Jimenez tackled infertility in such a compassionate and truthful way. It was gut wrenching and painful, but to those that have had their lives touched in this way or are a part of this club that no one ever wants membership to, it’s also unflinchingly honest. Kristen’s feelings of worthlessness and not being good enough will sadly hit home for many, but that’s what makes this book so compelling. I highly recommend reading the author’s note at the end as well since it gives greater insight into the story and characters. The epilogue brought everything together so wonderfully and I’m eagerly awaiting the next book, which features one of the beloved secondary characters who is sorely in need of their own happily ever after. Truly an incredible book and one that will stay with me.